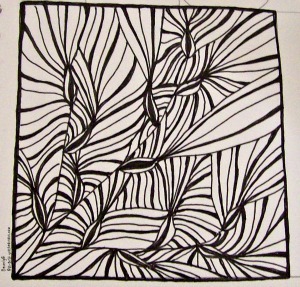 In amongst all the to do this week I found a new to me Zentangle Challenge. It's run by a very busy young lady named Joey. She lives in Canada. I wonder if she and Laura the diva know one another. Yep, it's Sunday afternoon. Joey says she never closes her linky to enter so I'm off to enter and good news tomorrow is Monday so she will have a new challenge up. Hope everyone who celebrates Thanksgiving had a wonderful holiday. It's back to school for us tomorrow then a busy schedule til school lets out on the 18th for Christmas holidays. Then you know what happens--It's a Happy New Year!! I am so glad that you found my challenge and that you had time in YOUR busy life to complete the Yuma challenge. Your variation is wonderful, I love the thickness of some of the stripes, it creates a nice effect! I haven't had the pleasure of meeting Laura but I do visit her blog and am happy that she has put Canada on the map in the Zentangle industry! I too love papercrafts and card making, combining the tangling techniques seems like an natural extension. Hope to see more of your challenges!